Deep South Dish: How to Make Homemade Gravy and Some Tips for Perfect Gravy! How to Make Homemade Gravy and Some Tips for Perfect Gravy! 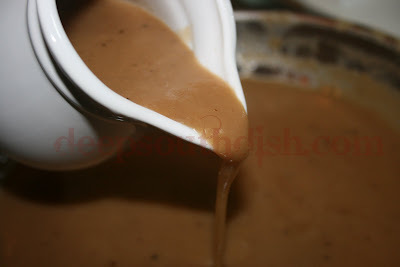 If you want to learn how to make homemade gravy, here's another for the "how-to" series of posts here. I know of lot of my regular readers are foodies and certainly know how to make gravy, but I hope that those in search of info will happen across this and find some help. We all had to learn somewhere! I recently made a casserole in need of chicken gravy and just today made roast beef po'boys and needed a beef gravy, so a "how-to" seemed fitting. Don't be intimidated by homemade gravy! It really is not at all difficult - if you arm yourself with a few tips and techniques - and guess what? Mistakes are generally easily corrected - meaning that unless you burn your roux or dump in a whole shaker of salt, you can fix them! In a nutshell, you take equal parts of fat and flour, and cook the flour in the fat to make a roux, and then add somewhere between roughly 4 to 6 times that amount of liquid, depending on the thickness desired. Simmer for a bit, then add just a bit of seasoning and you've got a fantastic, flavorful homemade gravy. The first picture above is a chicken gravy made with bacon drippings and chicken stock leftover from boiling chicken, then seasoned with kosher salt, fresh cracked black pepper, poultry seasoning and Cajun seasoning. Working on holiday gravy? Click here for the how to on How To Make Homemade Giblet Gravy in the Roasting Pan. This second picture is a beef gravy, made with canola oil and boxed beef broth and seasoned with kosher salt, fresh cracked black pepper, Cajun seasoning, and a dash of Worcestershire sauce. I often use a bit of Kitchen Bouquet to give my beef gravy a richer color, but didn't do that this time. I know that they look similar, but they certainly have their own distinctive flavors. Recipe is per cup. READ ALL INSTRUCTIONS INCLUDING THE TIPS BELOW, BEFORE STARTING! Making a gravy is easy, but it is a fast moving process. Heat fat in a heavy skillet over medium high heat. Have your measured liquid at the ready, plus extra in case you need it. Sprinkle in the flour a little at a time with one hand, while stirring briskly and constantly with the other hand, until all flour is incorporated and lumps disbursed. Reduce heat to just slightly over medium and cook for 5 minutes, stirring constantly and moving the flour mixture all around, including from the outside edges. Continue cooking until roux is a light to golden tan color, moving on and off the burner as needed to prevent burning. Turn the burner down to just under medium and remove the skillet from the burner. With the wooden spoon at the ready in one hand, begin to slowly but steadily pour all of the liquid into the pan with the other hand, stirring briskly and constantly until it is blended in well. BE CAREFUL! The roux will immediately bubble up and there will be a puff of steam, so unless you want a roux facial, don't be leanin' over the pan! The pan and the flour are very hot at this point, so you need to quickly disburse the flour and liquid around the pan so as not to burn it. Once all of the liquid and flour have been incorporated, return the skillet to the heated burner, grab your whisk and continue cooking on a medium simmer, stirring occasionally, for about 10 to 15 minutes, or until nicely thickened. Add seasonings, and Kitchen Bouquet if desired, taste and adjust as needed. Keep warm over very low heat, or transfer to a gravy bowl for the table. 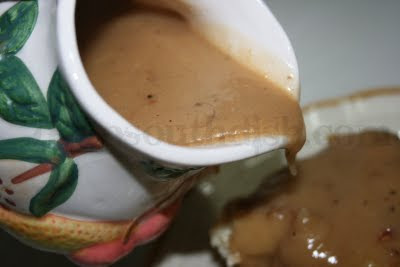 Directions are for 1 cup of medium thick gravy - use a bit of additional liquid for a thinner gravy. Double or increase ingredients as needed for desired amount of gravy. See tips below for info on fats, liquids and seasonings. 1. Suggested fats include canola oil alone or mixed with pan drippings, shortening, pure butter, or bacon fat. Pure butter works best, rather than margarine or whipped butters. Butter is the best fat base if you are making a cream sauce or gravy. 2. When using pan drippings, a fat separator comes in very handy and will keep your gravy from having too much fat in it. Pour off all of the fat from the skillet into the separator. Deglaze the pan with just a tiny bit of stock and pour that off into your intended liquid so that you have the pan scrapings in the broth or stock you are going to use. 3. Suggested liquids include bouillon or base, stock, or broth. Water works as well but should always be enhanced with either a base or bouillon. Never use water alone as it will dilute the flavor of your gravy. 4. Homemade stock resulting from cooked meats, such as a stewed or boiled chicken make an excellent and flavorful liquid base. Be sure to strain it before using it for your gravy. 5. To make a creamy gravy use whole milk if possible or a diluted evaporated milk, using equal proportions of water and evaporated milk works well. A combination of milk with another liquid such as base or bouillon enhanced water, stock or broth, also work well for a cream gravy. 6. If your gravy is too thick, continue stirring in additional liquid a little at a time until it reaches the desired consistency. 7. If your gravy is too thin, make a slurry of flour and water, placing a tablespoon of flour in with 2 tablespoons of cold water. Mix well with a fork. Add a couple of tablespoons of the hot gravy in with the slurry and blend. Whisk or stir the slurry into the hot gravy but take care not to drop in any undissolved flour lumps! Cook longer, about 8 to 10 minutes, so that the flour is cooked. Repeat if needed to reach thickness desired. 8. If your gravy has lumps, just strain it! Place a strainer of some kind over another container and stir to push it through. Return the strained gravy to the original skillet and heat it back up. 9. Be light with seasonings! Especially salt, and especially when using bouillon or packaged broths & stocks, since most already contain salt. Add a little at first, then taste and adjust. You can add more seasonings if needed, but you can't do much to take it away if you overdo it. 10. Suggested seasonings to use either alone, or in combination, might include, thyme, sage, tarragon, rosemary, parsley, chives, Cajun seasoning, cayenne pepper, hot sauce, dry mustard, horseradish, onion powder, onion salt, garlic powder, poultry seasoning, paprika, curry powder, lemon juice and white wine. 11. A splash of Worcestershire sauce can be added for a more robust flavor. 12. A splash of Kitchen Bouquet can be added to achieve a deeper color. Homemade gravy is absolutely the best gravy! I can always tell when it's homemade. I'm craving some comfort food now! oooh i should have added to my list of weird things about myself...i could eat gravy with a spoon. stopping by from SITS to see what's going on, love the site!! There's nothing like homemade gravy!And you are right about butter being the best fat to use. Your gravy looks smooth and perfect so, I'm suddenly wanting mashed potatoes smothered with your gravy! Wow! Thanks for all the great tips for gravy making! It always stresses me out so I usually dole the job out to my husband. Maybe now, armed with your know how I'll be brave next time. Grave is sooo easy, why should there be anything but homemade? I dont find that there is any difference using ice cold liquid or room temperature. If I have hot liquid, I ice it before adding to roux. The only way I cant figure it out is trying to make gravy in my roasting pan, I never can get all the flour and oil drippings properly mixed, I think my pans too big, so I just scrap the bits in my skillet. Now that's good to know. Thanks for the wonderful tutorial. Thanksgiving is right around the corner! Ooo! I needed to read this! I have dabbled in homemade gravy only a few times, as my MIL is usually in charge of the gravy at holidays (i.e. Thanksgiving at our house). I am so glad to have new tips! And thanks for stopping by my blog the other day -- you are so sweet! People seem to have problems with gravy but it should be something everyone knows. Stopping by from sits! This looks incredible. Thanks for stopping by - I'll be back to steal recipes for sure! I just made this gravy for dinner tonight. Had country fried steak and mashed potatoes. I think it is the best gravy I have ever made. Thank you so much for this recipe. Thanks so much Duan for taking the time to come back and leave a comment - I appreciate that!! Okay....Your recipe says that it yields ONE CUP of gravy. In my house, one cup is a serving. So, do I need to submit my recipe for a VAT of gravy? Your recipe is spot-on, as are your tips. I've been making gravy just like this for 40 years. It does demand your focus and attention, but it's worth every second. Thanks for spreading the Gospel of Gravy. LOL Jule, yeah, I figured I'd write it for a single cup and let everybody figure out how much they'd like to increase it! I usually do about 2 myself, sometimes more. Thank you, this is just what I needed, making some today. "Our family is Oklahoma, Texas, Louisiana and Kansas. Mama would always make her own gravy and had me perfecting roux at a very young age. Her gravy was always so rich...the secret was adding just a tad bit of instant coffee (not too much) while the gravy was simmering. It made the gravy rich in color and in flavor. Just one of those old kitchen secrests that we always loved at the dinner table! Coffee? Now THAT is interesting! Thanks for sharing your secret with us!! Definitely gonna give that a try. Hi Mary....tried this tonight...yum..yum! I was always nervous to make my own gravy...but not anymore! Thank you for sharing! You're so welcome Claudine - happy to help! Hi Edwin! I just use the generic term in the recipe, since the fat you use can vary. On down further past the recipe I've included some tips - be sure to check those out! "Suggested fats include canola oil alone or mixed with pan drippings, shortening, pure butter, or bacon fat. Pure butter works best, rather than margarine or whipped butters. Butter is the best fat base if you are making a cream sauce or gravy." Hope that helps! I remember smelling onion when my mom made her gravy. Can I add some sliced onions while making the roux, before the liquid? I would remove them after the gravy has been made. No one likes to see or eat onions in my family...but they love the taste of them. Oh yes indeed! This is just a basic recipe - I often add onion, though I do leave it in! Your gravy recipe is great and it's what I grew up on, however, I found that I can make a "just as good gravy" with no fat. I get the 16 oz. container of brown gravy mix at Sam's. Then I use 32 oz. container of chicken, turkey, beef, or seafood broth to mix with 3/4 cup of the gravy mix. I use this for the base of my seafood gumbo or whatever kind of gravy I want. It takes less than 10 minutes and everyone thinks it delicious. white lily; any idea of where to find it?